This floral still life tapestry Monkey In Still Life II shows a cheeky monkey among lush fruits and display of flowers. Here we see an idyllic collection of flowers in full bloom in the garden perched on a stone ledge. Flowers have been used since the 17th century as the primary subject to display a celebration of beauty through rendering flowers in a fantasy arrangement. 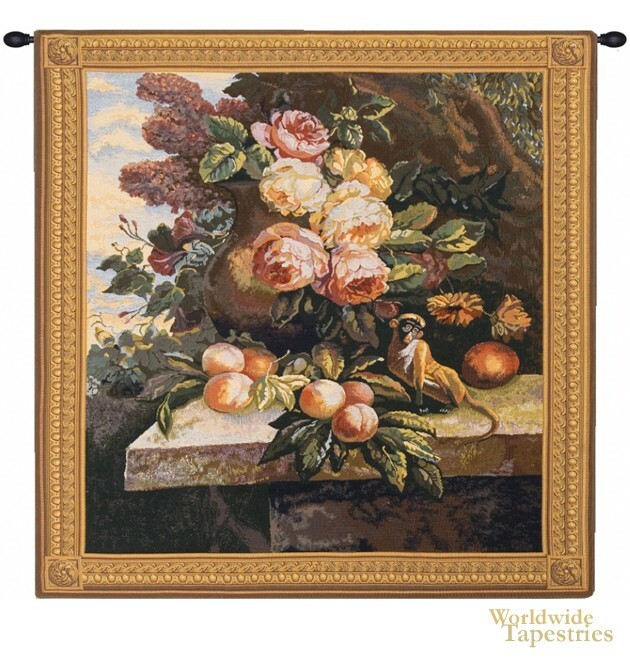 Monkey In Still Life II tapestry is backed with a lining and a tunnel for easy hanging. Note: tapestry rods and tassels, where pictured, are not included in the price.